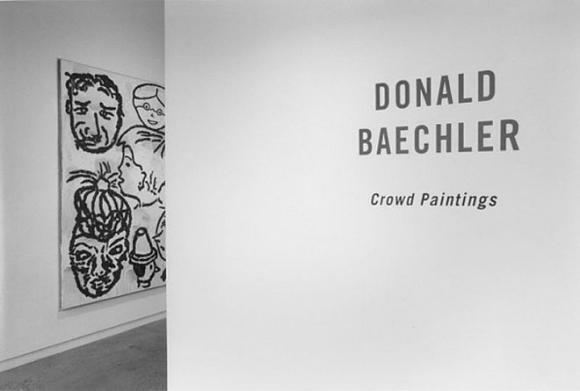 We are pleased to announce an exhibition of paintings by Donald Baechler. Born in Hartford, Connecticut in 1956, Baechler has lived and worked in New York City since 1977 and has shown extensively internationally since his first one person exhibition at Hallwalls, Buffalo in 1982. This year the Basel Kunsthalle presented an exhibition of very large collage paintings. The forthcoming exhibition at Cheim & Read is comprised of a group of paintings collectively called CROWDS. These large canvases are made up of faces retrieved from throw away doodles, commercial packaging, third world signage, and personal invention. An affectionate misanthrope, Donald Baechler makes beautifully painted black and white pictures that evoke an Ensorian kind of humor. The exhibition remains on view through Saturday, March 27th, 1999.